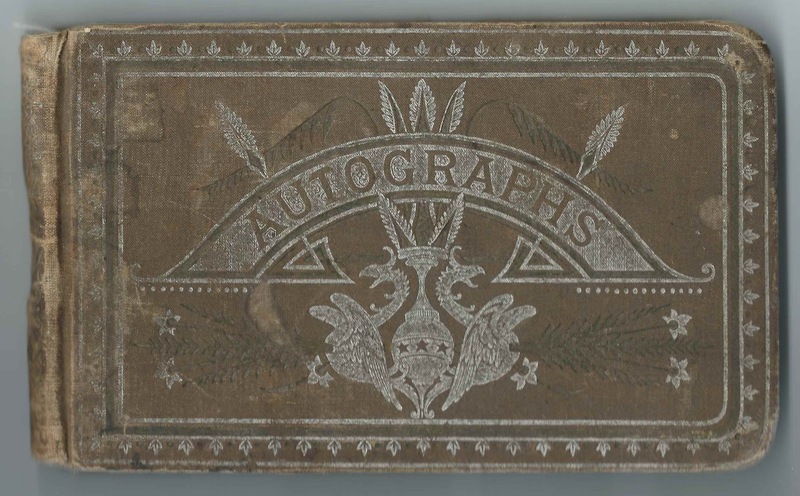 Autograph album that was kept by owner Mary Louise Fox of the Sandusky, Ohio, area, from 1883 to 1927, from before and after her marriage to Frank Jacob Hess. 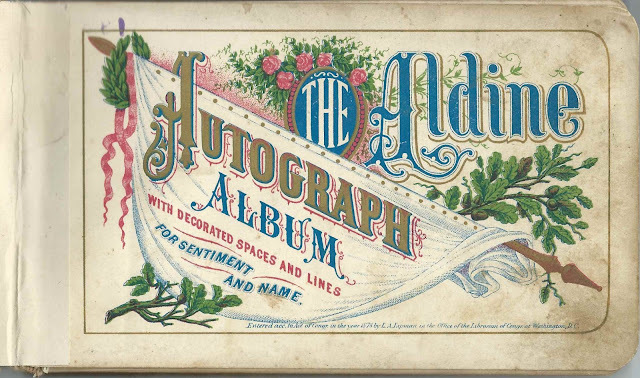 The later inscriptions were from Mary's grandchildren. The album measures approximately 7" by 4-1/4" and contains nearly 100 inscriptions; some people inscribed more than one page. 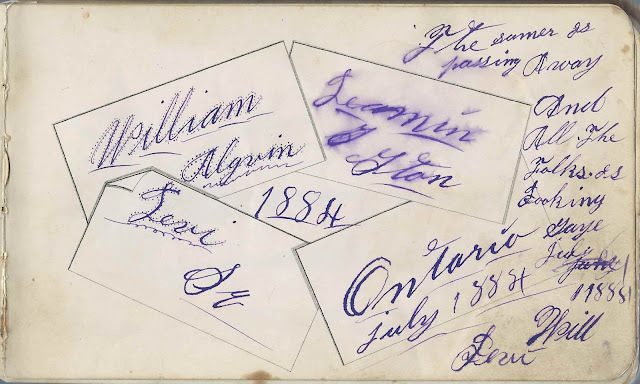 Inscribers include Mary's relatives, some of whom may have been her in-laws, and friends. Several inscribers mentioned W. R. N. S., presumably Western Reserve Normal School, where Mary herself may have been a student. The school closed in 1889. An alphabetical list of the inscribers, together with any personal information they offfered, appears at the end of this post. Mary Louise Fox was born August 15, 1865 in Perkins Township, Ohio, the daughter of Allen Fox and Eliza Catherine (Bartlett) Fox. On June 18, 1891 at Sandusky, Ohio, Mary married Frank Jacob Fox. 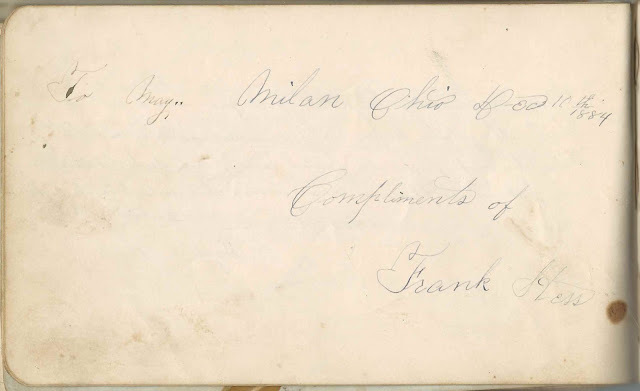 The Frank Hess who inscribed a page in Mary's album on December 10, 1884 at Milan, Ohio, was presumably Frank Jacob Hess. Mary and Frank raised their family of two daughters in the Sandusky, Ohio, area. 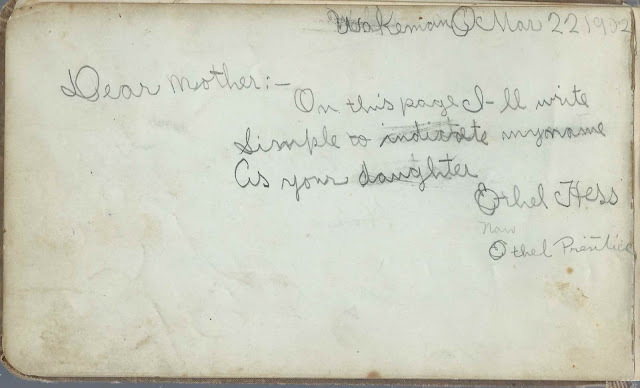 Their daughter Ethel May Hess, "Effie", inscribed a page in her mother's album, as did Effie's children Harold and Pauline. Mary and Frank both died in 1951. I believe they're both buried in the Perkins Cemetery at Sandusky, Ohio. Ella E.; inscribed at Milan, Ohio, on August 20, 1883 at Western Reserve Normal School. Presumably Ella E. Eshenroder, future wife of inscriber Myron Talcott Foote, who inscribed the left facing page. M. T. Foote; inscribed at Milan, Ohio, on November 22, 1883. at Western Reserve Normal School. Presumably Milo Talcott Foote, who would marry inscriber Ella E. Eschenroder, who inscribed the right facing page. Flora Fox; inscribed at Avery, Ohio, on December 24, 1897. Mary's niece, daughter of Mary's brother, Joseph A. Fox and Mary Ann (Marble) Fox. Flora May Fox; inscribed on December 30, 1897 at Perkins, Ohio. Mary's niece, daughter of Mary's brother Joseph A. Fox and wife Mary Ann (Marble) Fox. William S. Harvey; inscribed on November 4, 1883. Later note: "Died June 16, 1891. Inscribed another page on the same date. Daniel Hess; inscribed on January 28, 1885 at Milan, Ohio. Brother of Mary's husband Frank Jacob Hess. Rosa Lawrence of Milan, Ohio. 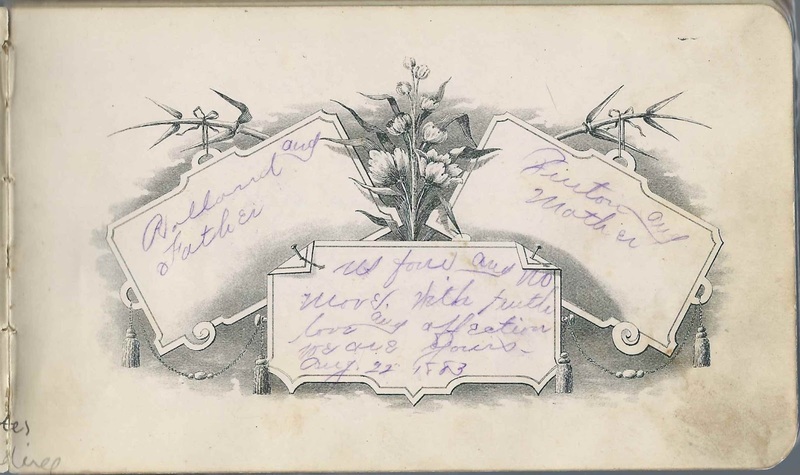 Later note: "Died 1885"
B. M. Noland; inscribed to Frank and Mary Hess on July 27, 1908; inscribed multiple pages all on July 27, 1908 and on one gave his Civil War information: "Co. F, 80 Regt, Ohio Veteran Volunteer Inft. 1861-1865"
S. V. Osgood; inscribed on November 4, 1883; inscribed another page on the same date. Julia Turner; inscribed at Milan, Ohio, in September 1883. Later note: "Died August 28, 1886"
Kittie Wood of Blissfield; Mary's "C.E. Cousin" Could C. E. stand for Canada East?